The Literature Centre’s seventh annual Celebrate Reading National Conference, titled Insights into Quality Australian Literature for Young Adults will be held from Friday 26 October to Saturday 27 October 2018. Brendan Ritchie will join authors Cath Crowley, Will Kostakis, Jay Kristoff, Jaclyn Moriarty, James Roy, Jared Thomas, Fiona Wood, and Claire Zorn over the inspiring two-day event. Held at The Literature Centre based in the iconic Fremantle Prison, the conference includes panel discussions, solo talks, book signings, and more. To find out more, and to register, head to The Literature Centre’s website or their Eventbrite page. Brendan Ritchie will be appearing as part of the Margaret River Young Readers & Writers Festival at the end of next month. The Young Readers & Writers program tours schools in the region promoting “the joy of reading from the earliest possible age.” Participating writers include Deborah Abela, Sasha Wasley, as well as artists Chris Nixon and Andrew Frazer. To find out more, visit the Margaret River Readers & Writers Festival website. Head to the Civic Square in Booragoon on the 18th of November for the exciting new Merge Festival. Brendan will be speaking at a session called On the Couch – Conversations with Authors (Adult Fiction), alongside fellow author Mihaela Nicolescu, facilitated by Jane Fraser, CEO of Fremantle Press. This session is on at 4pm at the Civic Centre Reception Hall. Book signings available, with your ticket price (just $10) redeemable on book purchases at the event. Head over to Eventbrite to grab a ticket. 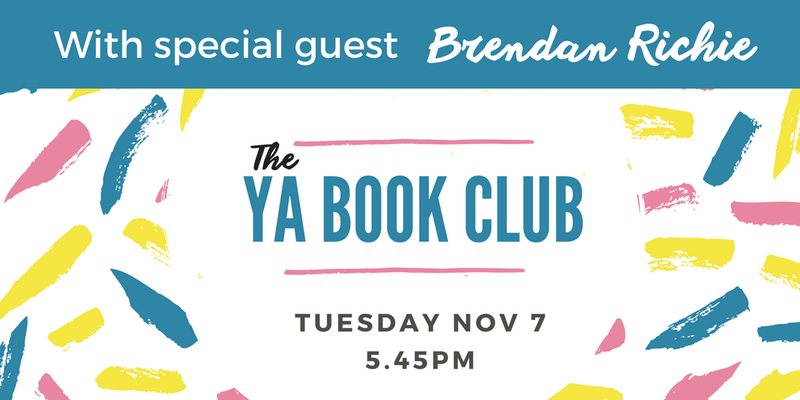 Brendan will be at Dymocks Joondalup on Tuesday the 7th of November for their November YA Book Club. Starting at 5:45pm with free admission, Brendan will be answering questions about his books and writing experiences. He will also be signing copies of his novels Carousel and Beyond Carousel, which will be available for purchase on the night. For more information, visit the Dymocks Joondalup website, or hop straight over to RSVP on Eventbrite. Jane Fraser, CEO of Fremantle Press, flew to Melbourne for Books at MIFF earlier this month. You can read more about her trip over on the Fremantle Press website. Head to the City of Perth Library’s foyer for a showcase of the hard work Fremantle Press have done over their past forty years. Brendan’s novel Carousel is included amongst some incredible West Australian talent. The display will run until the 12th of April. Brendan was interviewed by Caitlin Nienaber on RTRFM’s Breakfast show this morning. Brendan and Caitlin talked about the sequel to Carousel, Beyond Carousel (out now in all good bookshops!). They also discussed how two overseas musicians could end up in the sprawling mall of Carousel shopping centre, and what post-apocalyptic Perth might look like. If you missed it, you can listen over on the RTRFM website or below. Carousel has been reviewed by Louisa Loder, a fellow West Australian author. You can read the full review on her website (and check out the great photo she took). Thanks Louisa!